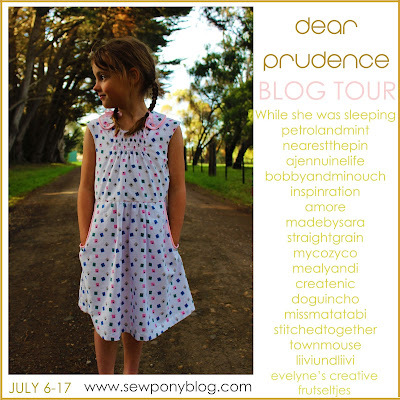 Dear Prudence, we love you! 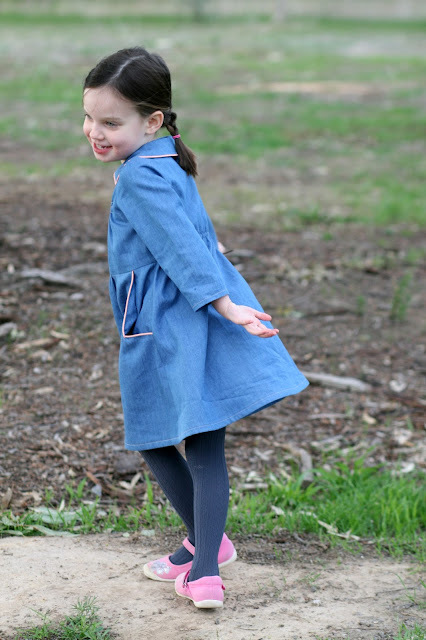 R loves you because of the pockets and buttons, and the fact she can jump all over her daddy, ride a bike, climb benches and simply monkey around without being restricted. I love you because you are fun to make. You have the cutest collar and unique details. You have a vintage inspired shape. You have sleeve options that makes you perfect for every season. The fact that there are no closures makes me love you even more because my girl can get dressed by herself! Yep. Both R and I love the Dear Prudence dress, the latest pattern released by Suz from Sewpony. When I was choosing fabric for this project I was a little unsure if R would approve it. She has very strong likes and dislikes. Blue is not in her good books currently. "I don't like blue. Blue is boring. But I like shiny blue", she tells me. Sometimes mama has got to make what mama wants to make! You see, I think R looks stunning in blue. This colour makes her gorgeous eyes shine. So without feeling convinced this lightweight denim would fit the description of 'shiny blue' rather than be labelled 'boring' I set to work. This rounded collar with decorative buttons and shirring at the front are my favourite features of the pattern. I love piping and would not miss an opportunity to use it. I chose apricot (aka pink if you are four) bias tape to make piping for this dress hoping that a splash of one of R's current favourite colours would make a blue dress more appealing. If you would like help with making piping you can follow Suz's tips included in the instructions to this pattern. 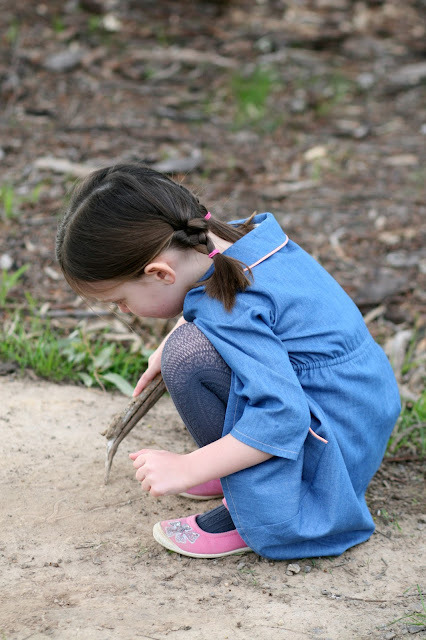 It was helpful to have tips on shirring included in the instructions also. I have attempted shirring only once before. I have heard that different machines handle shirring differently. I had a practice go on a scrap of fabric and discovered that using a longer length stitch did not work well on my machine. I tried a few different lengths and was most pleased with the result I achieved with the stitch length set at 3. Stitch length on my machine ranges from 1 to 5. 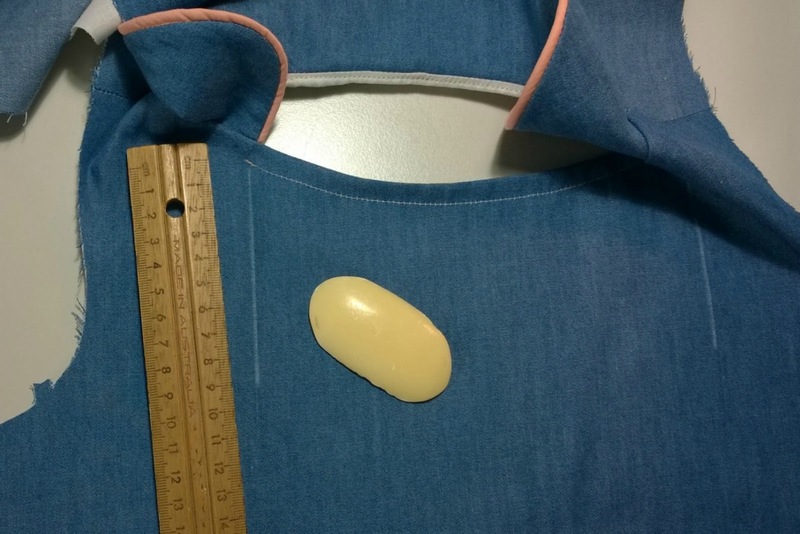 To make markings for the beginning and the end of shirring lines I used an old school trick - a piece of soap. The only 100% washable tool! In fact, I just wipe it off once I am done and there are no visible marks left on fabric. I could tell you what happened when I used an air erasable marker, but I am still too traumatised to talk about it! And yes, you can spot understitching ;) This step in not included in the instructions, but I did't want white lining peeking out! After jumping for quite some time R paused, looked at me and asked, "Are there pockets"? 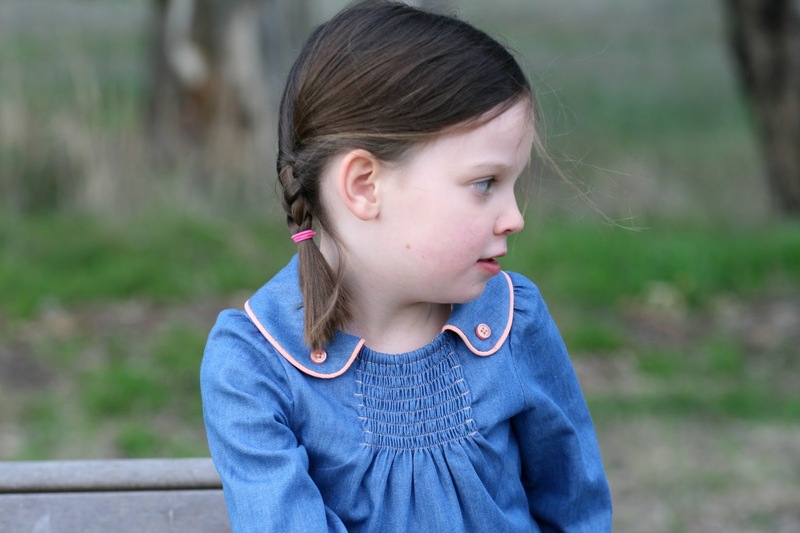 I showed her the pockets and explained there would be buttons on the dress later too. She nodded and went back to jumping all over daddy. There are no closures on this dress, so independent little monkeys can dress themselves. A piece of elastic inserted between the lining and the main fabric helps the dress sit nicely at the back. This step might sound a little confusing at first, but just trust Suz's instructions. Everything works out just fine in the end. After we took only a few photos the battery went flat, so we had to go home and replace it. Once we came back to out spot and took a few more photos the replacement battery went flat as well! Maybe it was for the best, otherwise I would have bombarded you with twenty more photos! 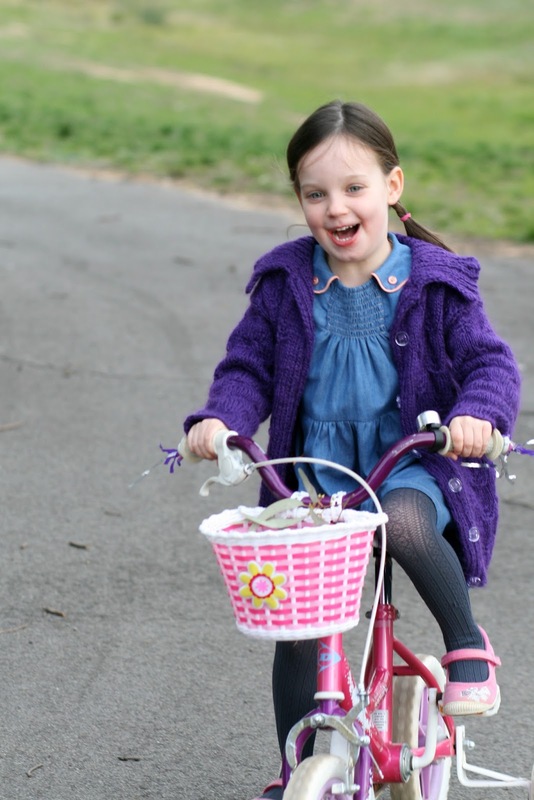 Do you know why R has a basket on her bike? So mummy would not have to carry all the treasures R finds! Yes, this big stick was declared a treasure! 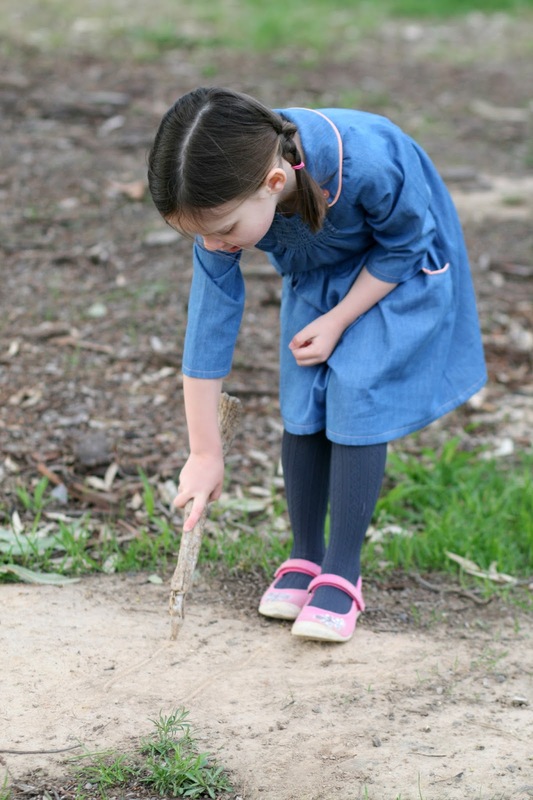 The treasured stick was quickly put to use - R wanted to write her name on a patch of dirt. She enjoys activities that involve letters and numbers. She constantly asks to tell her words that start with a specific letter. She loves writing her own name and names of her friends and kinder teachers. She simply can't get enough of it! 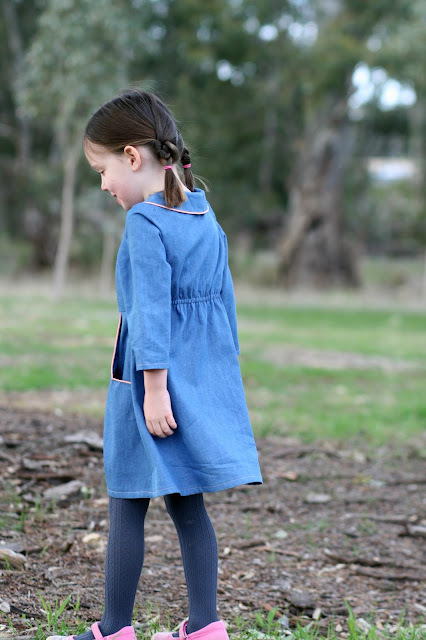 If you would like to sew the Dear Prudence dress for a special little adventure seeker in your life you can buy a pattern at Sewpony Vintage with a 15% discount using code PRUDENCE15 from the 6th until the 17th of July 2015. Today Miranda and Marleene are also showing their versions of the Dear Prudence pattern. Please visit other blog tour participants for more inspiration! Blue and pink (sorry, apricot) work perfectly ! Cute dress! And congratulations !!!! Thank you Marleen :) I am not the biggest fan of pink, but my daughter says it is her favourite colour (and straight away picks everything purple haha). Purple I had on hand did not look nice with denim, but apricot (which I sold out as pink to my sweet trusting munchkin) looked nice :) It was approved... Phew!!! very, very pretty. and thanks for the tip with the soap! Thank you Annika. Soap works almost every time (let's be honest, you won't see it on light coloured fabric). This is beautiful Jenya. I love your fabric choice, and coupled with that piping ... Be still my beating heart! Thank you very much Wen :) This dress is one of my fave recent makes :) I am constantly amazed at how fabric choices and trim options can totally change the appearance of a garment! 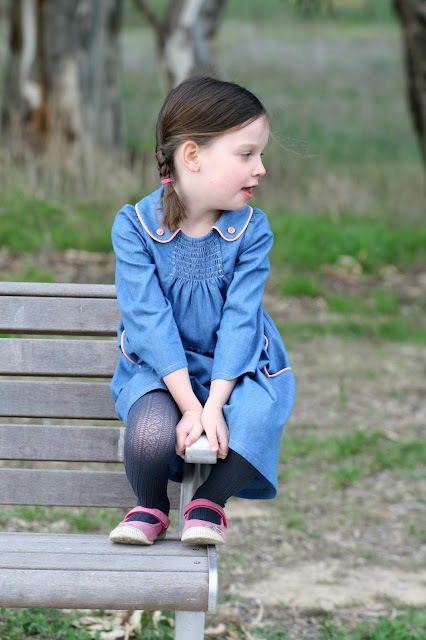 The pink piping is perfect for the shiny blue denim, Jenya. Looks pink from where I'm sitting - not so sure about the blue being shiny, though... LOL!!! R. is going to love those big pockets. hahaha we worked out that 'shiny blue' is light blue. Phew!!! 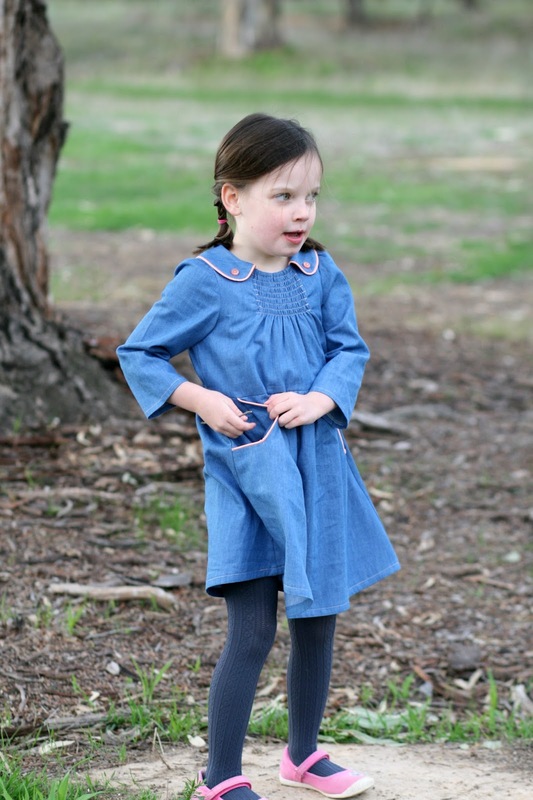 The dress is beautifully sewn and is a lovely look on her! You are so right, sometimes we just have to make what we want to make...good to hear it worked out and your daughter loves it too! Thank you Annie. It was certainly worth the risk. R loves floral prints. And by 'loves' I mean she would only choose florals. I must admit I am getting slightly tired of everything in her wardrobe being floral. I just had to make something else, more so for myself. I am so glad she loved the dress though! 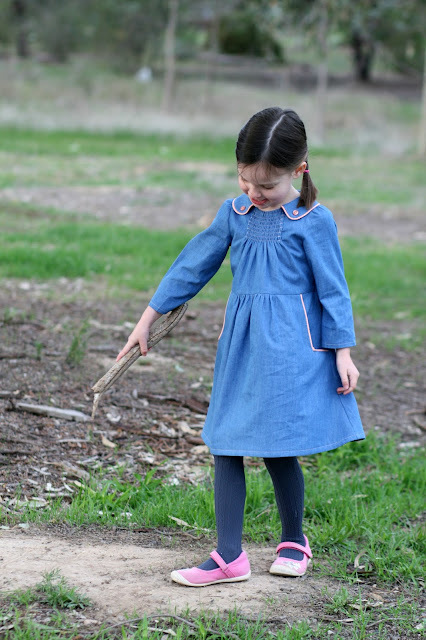 I love this dress version, while using one uni colored fabric the special details of the pattern make it wonderfully special! Thank you. Isn't it amazing how different fabric choices change the appearance of a garment? Thank you Suz. The fit could not be better! Will have to make a summer version once it arms up! C'mon spring!! I love your version of this dress! Thank you. 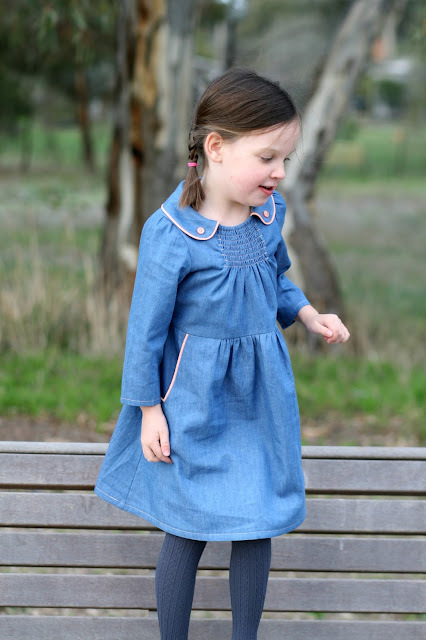 I think the piping and the shirring detail look brighter on this dress thanks to denim. Chambray is def my favourite! This is unbelievably adorable! You hit it out of the park with this dress! Fantastic! Thank you Rachel. it was definitely worth taking the risk and using this fabric! On the smocking or shirring part did you have to add extra fabric so it wouldn't make it to tight around the neckline? I've never had the opportunity to do shirring so needless to say I have no idea how to do it. The dress is absolutely adorable. How sweet! 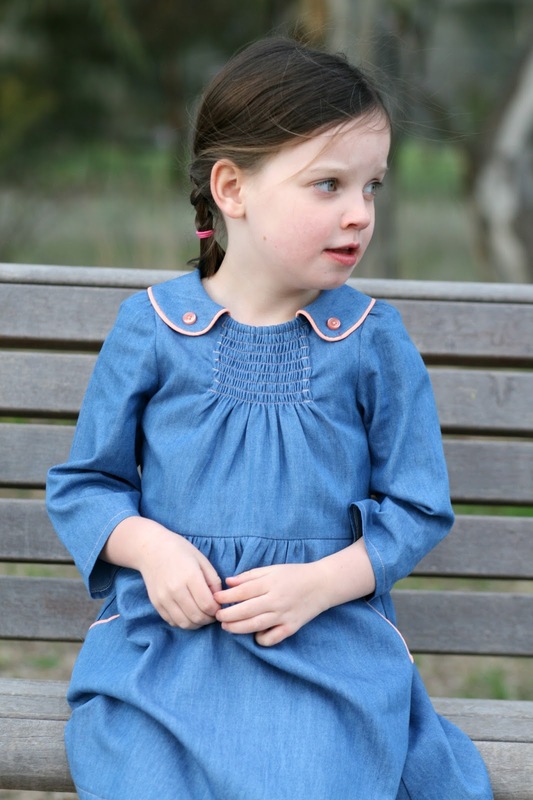 I love this design & denim with piping is an absolute winner! Thank you Shell. I think everything looks great in denim ;) but this design is definitely a winning combo of such well thought through details! So gorgeous! Love the piping and the buttons. Thank you Marisa. 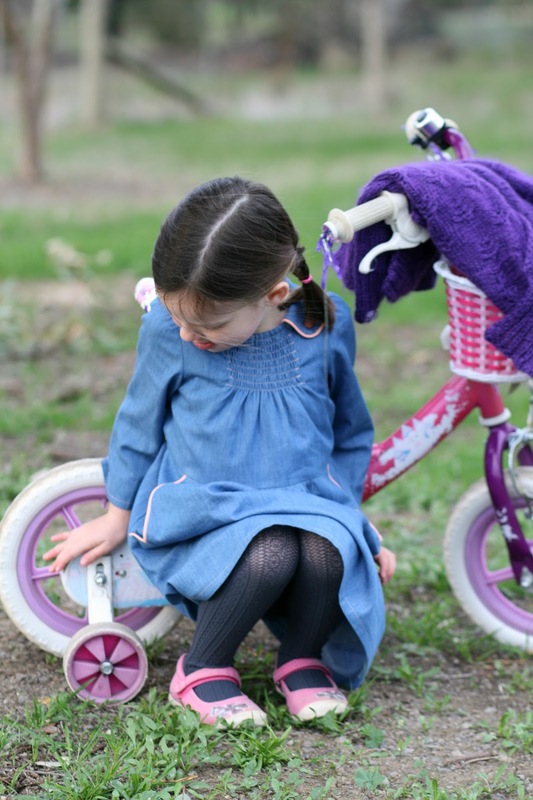 These are such sweet details, aren't they :) Suz has done a great job with this pattern.